Google always makes exciting products and their browser, Chrome, isn’t an exception indeed. I’m a big fan of the Google search engine as well as its browser, Chrome. In fact, when I came to know that Chrome is a product of the search giant, Google, then I downloaded the file on my laptop and installed it to use for an awesome experience at the time of surfing the web. However, this blog post isn’t solely for discussing Chrome. It’s a post that’ll show you how to use the Grammarly extension for your Chrome browser. Since Grammarly grammar and punctuation checker is a popular tool for checking grammatical and many types of errors in any text, more and more people are asking me how to use the Grammarly on their Chrome browser so that the digital eyes of Grammarly can detect their writing flaws in real-time. If you wanna learn more about Grammarly, you can read Grammarly review right now. Now, I’m gonna tell you something about the extension. You know that Grammarly is a multi-functional online writing editing tool. The tool can check your grammatical issues and detect them. You’ll be notified with red underlines where you’ve made mistakes while writing. It corrects spelling mistakes and when it comes to using proper punctuation marks in your writing, Grammarly can help you too. The Grammarly premium version also offers plagiarism checking feature which makes it an all-in-one online writing editing tool. No matter where you’re writing your content, you can have Grammarly to help you detect and correct your writing flaws. Yes, if you’re on your favorite Chrome browser, you can still use Grammarly just by using its Chrome extension. Now, let’s check how to use it on your browser. You can install the extension in your browser in two different ways and I’ll show you both of them. First of all, visit Grammarly and sign up for an account if you don’t have one yet. If you have an account of Grammarly, then you’ll just need to log into your Grammarly account using your username and password. So, Visit Grammarly Now by hitting the above link. You can see that there’s Active on the right side of Grammarly for Chrome. This is because I have already installed and activated the Grammarly extension on my Chrome browser. If it hadn’t been installed yet, then you would have seen an Install button instead of the Active button. Now, click on the Install button and it’ll be installed on your Chrome browser. This is not all, you’ll have to activate it which will be shown in the further steps. This is the final stage of activating the extension on your browser. To do so, swap the Check for Grammar and Spelling on newtab button right and Grammarly will be activated on your browser. You can also swap the next button to activate that option too. Also, you have the full control of choosing American or British English as your writing language. Select the version of the English language as per your choice. After setting up all the things, you’ll start seeing that all of your online writing is being checked in real time for finding flaws. Now check the other way of installing the extension in your browser. First of all, open your Chrome browser on your computer. Once the browser is fully loaded, go to the control button situated on the top right corner. From the drop-down menu, reach out to the Extensions button through the More tools button. This will show all of your active extensions. Go to the main menu situated on the top left corner of the browser. After going t the main menu, you’ll find the Open Chrome Web Store button at the bottom. Click on the button and you’ll land the world of Chrome extensions. On the left side, you’ll find the search the store box. Go there and type Grammarly for Chrome. You’ll see some (currently three extensions are found if you search with this term) extensions in the search extension result page. From the list, the top one is your desired extension. You see that there’s a green ADDED tag seen on the left of the extension. This is because I’ve already added it to my browser. However, on the right side of the extension, you’ll see the ADD TO CHROME button. Hit the button and the extension will be added to your browser. So your extension is now installed in your browser. Now the only things that you’ll need to do are follow the step 4 and the step 5 shown in the previous method. Go to the Grammarly icon and follow the two steps. Note that the extension activation using this method will work well even without signing up for a Grammarly account, but to get a better experience, you must create an account. You can use the extension to create your Grammarly account if you don’t have one. Also, if you have an account, don’t forget to log in through the extension. Why Use the Grammarly Extension? Grammarly can detect flaws in your writing, but to do this on its native platform, you need to copy your content and then paste that in the checking box of Grammarly. This is really a hectic job in most cases. You can also upload your file to the Grammarly’s native platform, but still, you need to have a downloadable format of your content. How about using the tool while creating content online? If you want to have this awesome feature, then you need to use Grammarly’s extension. You just need to activate the extension on your browser. You’ll find the extension handy when you’re writing emails, crafting blog posts on your WordPress dashboard, leaving comments on other blogs. Note that there are some sites which don’t allow Grammarly, so in those sites, you couldn’t be able to use the extension. However, since the extension works on most online platforms, you can’t live without it for a moment when writing online. 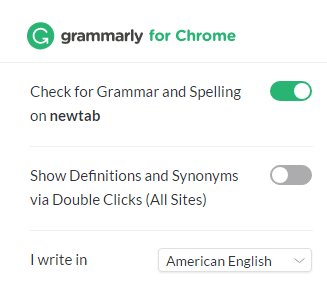 So these are the easy steps to getting the extension of Grammarly on your Chrome browser. I cant open the extention. it is in my chrome browse but shows up blank when i click on it, i followed all the steps on here from both methods. I am using a linux computer if that has something to do with it. so help me trouble shoot. Have you created your account? Please delete your cache & check again. Can you please tell me why do I have BETA across my Grammarly icon? Thanks for asking me the question. You know that Beta is the pre-released version of an app or software. Since Grammarly has recently started testing with Google Docs along with some other platforms, you may see the Beta icon. It’ll be removed soon once the testing is complete.